I am already tired of Homecoming and it hasn’t even happened yet. When I was young, as in high school, as in decades ago, as in the olden days, Homecoming was a very different gig than the one I’m facing with “my” kids today. It’s an interesting irony that my kids attend a school, Sehome High School, with the same initials as the one I attended: Scitutate High School: SHS. We were the Sailors; they are the Mariners. We had a football team; they have a football team. We celebrated Homecoming; they celebrate Homecoming. The similarities around Homecoming end there, seriously. Like today, of course Homecoming for us Heralded the big rival game of the Football season. 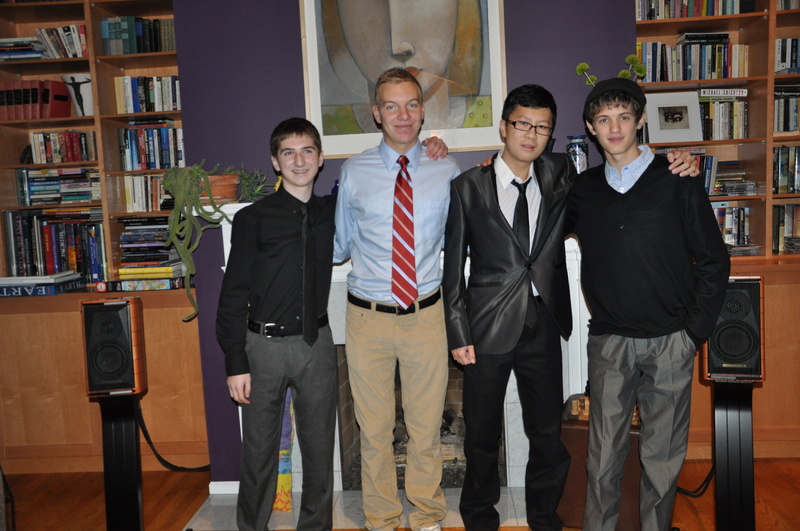 Homecoming was THE event of our fall season. Our home team, the Scituate Sailors, played their big game and we all went to root them on. I can say that I barely missed a single football game in four years of high school, but I can’t remember who our arch rival was then. I took it all pretty seriously then, but those memories have faded. At the time, I was on the Boosters. We ran the concessions stand, made the annual float, and like the rest of our town and our cheer squad, cheered for our boys. 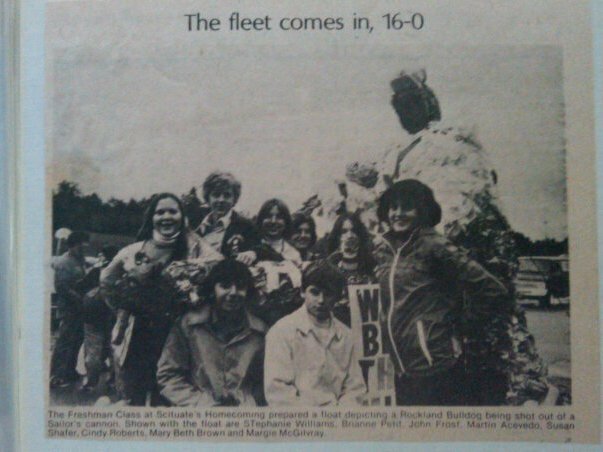 We were a one high school town, so every kid eventually became a Sailor. Collectively, we had enormous school pride, so most of us showed up for the games. I went to every one with my buddies and spirit in high gear. Usually there was one boy I cheered louder for and for several years it was the same guy. Nothing ever came of that, but there I was clipping newspaper articles about him and showing up for the games. 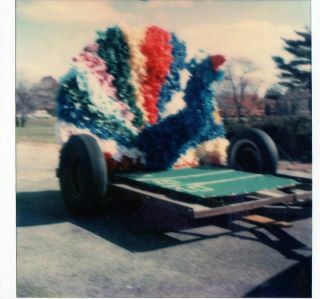 It was all about the big game, a big float and the big Dance. Like my kids today, we couldn’t wait for the dance. However, things in almost every way have changed a lot! 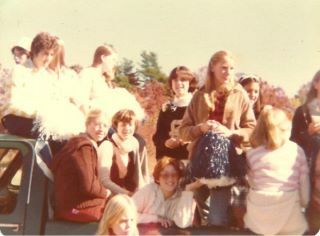 (<– The 1980 school float) Leading up to Homecoming, those of us who were involved, worked tirelessly on the float. It had to have some kind of theme and we took it very seriously. Our school was fairly small but we had a good team . Homecoming was a game that pretty much everyone turned out for, and hoped for a win. As I remember it, we won more than our fair share. The game was played in the day on a Saturday and the dance was that night. Parents and kids alike went to the game. Every kid went to the dance. It was what we did. But our dances were a far cry from the semi-formal events that my kids deal with today! Back then, the highlight was the music. There was generally a live band, and some recorded music for in between. There was little formality to the dances. Levi’s straight leg cords were THE cool thing to wear and they came in all kinds of colors, that’s where the decisions ended. “Preppy” ruled and the room was a sea of Dean sweaters and corduroy; a rainbow of preppy navy blues, kelly greens, pinks, yellows and burgundies; Duck shoes and matching belts with whales, or shirts with the Lacoste alligators. There were no formal dresses, no ties and suits for the boys. We were there to dance and celebrate and formal was for the prom. We decorated for the Homecoming dance, but it really came down to fairly minimalist stuff by today’s standards. I went to each Homecoming with the same pipe dream (cue violins) of being asked to dance by the boy I liked at the time, or at least being asked to dance when I got there. I went to each dance hoping it would all turn out the way I dreamed, but that never really happened. Oh what a pitiful story it is, but alas, true. My mother would wait up for me each dance, and I would slip into her room and tell her my stories of woe. There were a few special dances, but I was rarely dancing to Stairway to Heaven, the pivotal final song, at the end of the night and I never really got the boy. Honestly, while I went with that hope, there wasn’t such a big build up to those dances as I see today. I hadn’t invested in a special outfit and few people went as dates. You got together with someone you liked at the dance, rarely before. As things have become more and more of a formal affair with Homecoming, I wonder with my own kids if that makes a difference in the expectations of the evening. Today, Homecoming has become pretty akin to what our prom was then: a major dressy event. Girls go out and buy fancy dresses, get their hair done and put a lot of time and money into the Homecoming dance. Boys actually don ties, nice slacks and shirts. Last year when 14 year old Little Man went, he was the only boy in his group, wearing sneakers. Oh the shame! Corsages and boutonniérs are purchased now. Boys are expected to come up with increasingly creative ways of asking girls to go with them (not quite as dramatic as the prom now, but still a leap from “my day”). Kids today go out to dinner before hand (more money), or their parents organize elaborate dinner parties at home. Flowers, wonderful food, decorations and lots of pictures are taken, and this is all before the dance! The pressure seems huge to me and each year, I catch myself tisk tisking, even as I help my kids plan. The focus at the dance today is to prevent “grinding” and make sure no drugs or alcohol are brought in. 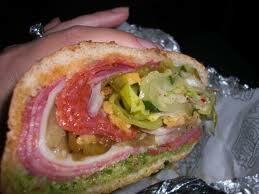 At our dances there was no such thing as grinding; but we ate grinders (or grindahs) after the game. The closest we got to anything extreme was possibly kissing while slow dancing, but again, I was out of luck there too. Smoking cigarettes in the girls room was the big thing that chaperones watched for and while I know kids were drinking then too, it didn’t get the airtime it gets now. There were the clichés of every John Hughes film: the girls sitting or standing on one side of the Cafeteria (where our dances were held, just as my kid’s dances are held); the boys on the other side; a few of those couples that everyone envied, going steady; the cheerleaders and football stars ruled and the rest of us were happy to share in their glory. It was an amazing night, even when my dreams didn’t come true. As each of my own kids have passed through this right of passage, I struggle each year with the issues all of us parents grapple with: wanting my kids to be well-adjusted, confident teens; who make wise choices; aren’t led by peer pressure; have fun; but are included. Each year I hear myself complaining with friends about how complicated and expensive this has all gotten; the changes that we don’t understand and don’t necessarily approve of; all the drama and formality. It seems like a lot of pressure to me, but it’s part of the fabric of my children’s teen years. They take the fancy dresses and ties for granted. They do not pay for any of it. All three of them have come to me at one time or another and worried a little about asking someone to the dance, or being asked; looking just right and fitting in; planning the big event, but in the end, it’s their normal. Ironically, the game itself has not been a big priority, something I bite my tongue over each year. Okay, maybe I don’t bite hard enough, but really! The dance has become so much bigger than the game and I don’t really get that.We were nothing without our team at Homecoming. when I was in high school. This year, Little Man was much more excited for the dance. He didn’t have a date, and I had to check my own expectations and hopes at the door to the Gap, where we went shopping for dressy pants. He’s at that difficult size where nothing fits well, but he still managed to find a pretty snazzy outfit that he felt really good about. He added a hat to his ensemble, that he thought was cool. He probably won’t wear it again. China had to knuckle down and spring for some dress pants too. He was not all that enthused with all the prep, but as today got closer, he shared that he didn’t really like his hair and needed help with a tie. Today I was able to get one of the younger stylists at that salon I go to, to cut his hair a little edgier, and dad helped with the tie. Welcome to America: spend money and fit in; oh, and have fun! I helped the boys make a reservation at an inexpensive, local restaurant and I called ahead to help pave the way. “They are good kids,” I told the college- age girl taking the reservation. “But they’ll need a little help. Separate checks with the tip and tax included.” She chuckled and told me that she remembers what a “nightmare” it was going out with her friends for Homecoming. They’d never eaten at a proper restaurant without their parents. “Yep, this is pretty much the same thing… and they’re boys!” I told her. A couple of girls, friends only, joined their group in the 11th hour and we added to the reservation. Tonight the boys all came to our house early, to play video games, hang out and head out to dinner together. One of Little Man’s friends is here from Germany for three years and his best friend is Greek (but born here). So the U.N. was in full force at dinner tonight: U.S.; China; Germany; Greece and a few Hamsters. When it was time to get dressed, they complimented each other and dad helped with all the ties. It was fun to see how uniquely themselves each of the boys looked. China wore a dressy jacket from home with new pants from here. All agreed that he was the most stylish. Germany impressed everyone with his “European businessman edge.” I noted that he wore Levi straight legs. When I mentioned that they came out when I was in high school and we all wore them, he beamed “they are so cool!” Greece was voted “Corporate mogul,” in his sharp black/gray outfit; and the U.S./Little Man was super cool in his hat, and all agreed the sweater was a nice touch. We also joked that he looked a bit like a “stylish golfer.” Sadly, Denmark, who had bought a beautiful dress and ridiculously high shoes, got sick and had to stay home. Her feet will thank her tomorrow. She will miss this one big “American tradition,” but she’s got hopes for the prom. I watched my Little Man get dressed and was amazed to see him transform from gangly, awkwardness to a handsome 15 year old. He’s a great kid, who has his head on pretty straight and isn’t really into all the drama of the age yet, and neither are his friends. They avoided the drama of last year when some girls ran the show, and did their own thing this year. As he left, I hoped Little Man makes wise choices. I hope he has fun. And though it’s not yet on his radar, I hope he gets asked to dance. Seriously. Epilogue: Just as I finished this post (a day+ after starting it), the boys came home from the dance. Coming from the blaring sound of the cafeteria and hours of loud music, they came in yelling and jacked up on adrenaline. They shared that the dinner out was nearly as fun as the dance itself; everyone had a blast. Three kids at their table offered prayers before dinner (in three faiths) and one of the boys included a prayer for the safety of the troupes overseas. A young man approached their group and thanked them for doing this, as his brother is in Afghanistan. China had a great time at his first American dance and “got someone’s number.” Greece had a fantastic time and danced with several people, which made him happy. Germany didn’t dance much, to the frustration of the posse, but looked great. And as if planned, and likely it was, very little info about the U.S. was available to the Secretary General. He admitted to having a great time, not wearing his hat for most of the night (too hot) and no word on dancing with anyone special. Oh well, I can live with that. Note: The boys gave their permission for the photo included here; I think they felt pretty good! This entry was posted in Blog, Honest observations on many things, Humor, Mothers, Musings, Parenting, Teens, The U.N. and tagged high school, High School football, Homecoming, Homecoming Dance, Humor, mothers, musing, parenting, Scituate High School, Sehome High School. Bookmark the permalink. 2 Responses to Homecoming… Seriously. What a handsome, respectable, and respectful bunch! So glad they had a good time being who they are! They really are sweet boys. Enough to make a mom feel pretty darn good! 🙂 Thanks for reading!